Baader Maxbright Binocular with aluminum case. This item is supplied with a glasspath corrector of your choice and either a 31.7mm or 50.8mm nosepiece. The Baader Maxbright Telescope Binocular Viewer has new proprietary Baader metal die-castings, featuring redesigned prism seats made to the same precision as the Mark V viewer. Includes laterally adjustable eyepiece holders (with diopter adjustment and multiple clamp screws). The Baader Maxbright Telescope Binocular Viewer features full Multi-coatings on all air-to-glass surfaces which deliver a very bright and contrasty image. 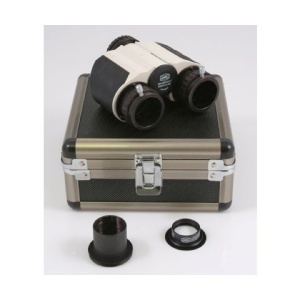 Excellent illumination of all 1.25" eyepieces - even long focal length wide-field eyepieces.